This formula is extraordinarily effective on tough stains, using active enzymes and thoughtfully sourced ingredients that won`t fade colours. Vegan, cruelty free and carbon neutral. Water, Denatured Alcohol, <5% Non-Ionic Surfactants, Potassium Sorbate, Citric Acid (Protease), Perfume and Limonene. Shake well before use. Test on an inconspicuous area first to check for colour-fastness and that surface or fabric to be treated is not affected by water-based product e.g. some wood furniture or silk. Stain Removal - Laundry: Apply directly on to stain and let soak for 5 minutes, then wash. Fabric and Carpets: Spray directly on to stain, saturate well and leave for 5 minutes, then wipe with cloth. If stain persists reapply and soak overnight. Wood Floors: This product can be used, but wipe clean after use and do not leave on overnight. Odour Removal: Saturate source of odour and soak overnight. If odour persists, repeat and reapply as necessary. Odour may persist while product is working. General Tips: Absorb as much of source of stain and odour before treatment. Stains and odours are best removed before they have had time to set. Some stains may require additional application(s). May cause eye irritation. Mild skin irritant. In case of accidental eye contact, flush with water. Consult a physician if irritation develops or if ingested. 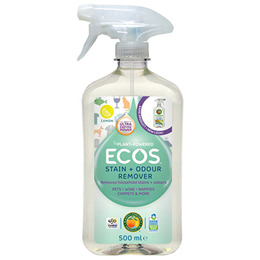 Below are reviews of ECOS Stain & Odour Remover - Lemon - 500ml by bodykind customers. If you have tried this product we'd love to hear what you think so please leave a review. This is a BRILLIANT product....great smell and a really efficient way to remove stains from carpets & upholstery. They disappear almost before you have finished spraying! And good to know it is kind to the environment. Highly recommended! I don't feel lemon scent? Excellent product works for me with doggy mistakes. This formula is extraordinarily effective on tough stains, using active enzymes and thoughtfully sourced ingredients that won`t fade colours.